Did you know we are also a small farm? Did you know we are also a small farm producing high quality vegetables and fruits naturally. 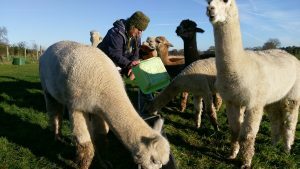 We also keep Alpacas and really free range chickens. You can buy from us at our farm gate where we keep an honesty box or call in, your welcome. Check our Facebook page for our latest produce. 9 Co-Options Buildings, Victoria Avenue, Prestatyn, Denbighshire, LL19 9DF. Have a look at what companies we manage, creating employment opportunities.